Making this downtown Los Angeles wedding at Vibiana a night to remember, wedding planner extraordinaire, Deanna Tat of Chic Ambiance Events, and candy table display stylists, Two's a Party, teamed up to create this stunningly beautiful dessert buffet. 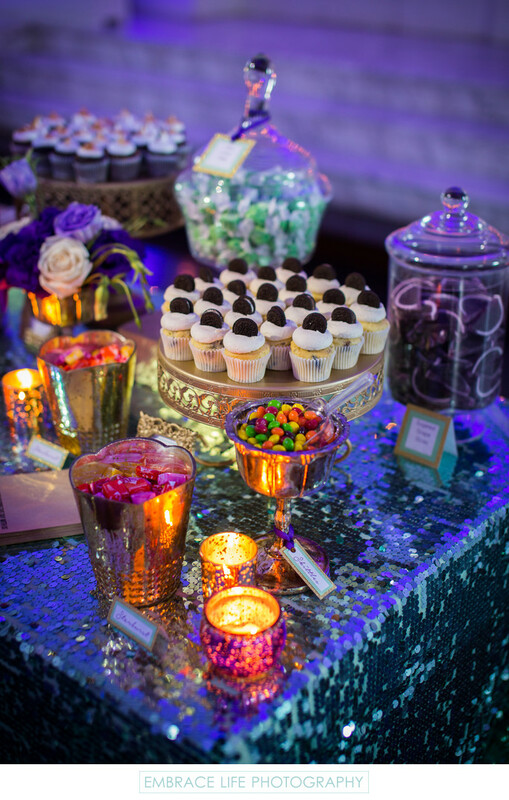 On top of the turquoise sequin table linen, by Luxe Linen, is an assortment of gold and glass jars filled with candy, candle holders, mini cupcakes and a bouquet of purple and white flowers by the always incredible Butterfly Floral. Location: 214 South Main Street, Los Angeles, CA 90012.